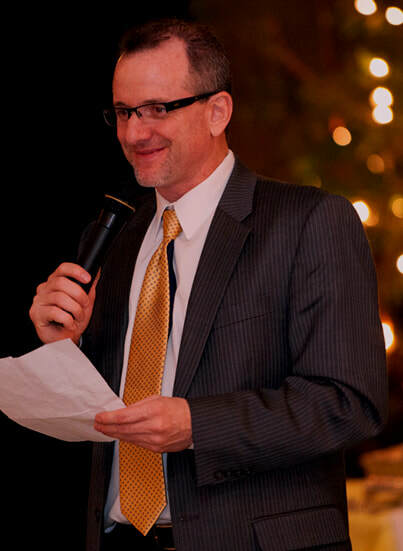 ​Mark has had a passion for helping couples create memorable fun wedding receptions since 1990 as a professional Disc Jockey and Master of Ceremonies. His entertainment background started when his talents were discovered during a contest at a popular Phoenix night spot. He went on to be one of the most sought after Disc Jockeys in the Valley entertaining at various night spots. His vision turned to weddings when couples asked Mark to entertain for them at their wedding receptions. Today as a leader in the mobile DJ industry Mark has served as the President and Vice-President of the Phoenix chapter of The American Disc Jockey Association in 2009 and 2010. Since 2010 Mark has been serving as the Advisory Committee Chair at Scottsdale Community College for the first ever accredited Disc Jockey program in the Nation. Public Speaking; After two years of training as a member of Toast Masters International, he has also been a presenter at Nation Disc Jockey conventions in Las Vegas on “The Science of Music Programming” and “The Art of Mixing”. (The Las Vegas DJ Show) 2013 / 2014. Education; Mark regularly attends performance seminars including The Wedding Merchant Business Academy and has completed several performance workshops including The Marbecca Method Master of Ceremonies workshop. Because of his talent, expertise and demand Mark has performed weddings and events for several Major League Baseball players, The Arizona Cardinals, MLS players, and local Politicians including the Mayor of Phoenix and the Governor of Arizona. Featured in "INSIDE WEDDINGS MAGAZINE"
"Everyone Was Having So Much Fun"
fun everyone had listening to you!" We want to say thank you so very much for all of your help & hard work! The services & ideas you provided to us for our wedding were outstanding. definitely recommend you to anyone we know! We had a blast." "You Really Made It A Classy Event"
made it a classy event, and got our friends and family on the dance floor. Thank you once again for not being the cheesy Disc Jockey." "You Just Added So Much Life To The Party"
have ever seen! Thank you so much for everything, Mark!!" about you and I am so glad that you were our DJ." "There Was Nothing But Praise"
found a better master of ceremonies." "I Loved How Everyone Danced And Had A Blast"
thank you, I can't thank you enough." "The Creativeness That Made Our Celebration Unique"
ideas ! The creativeness that made our celebration unique. we hoped for, a rocking good time. asked & whenever we drew a blank, he filled it right in!" "You Did An Outstanding Job"
family & friends asked about you & told us what a great time they had. they liked the music, from grandparents to 20 something. soon wedding! Thank you Mark!"